In the Northern Tradition, the most terrifying of the goddesses comes in the form of death. Her name is Hel. Sometimes Her name is spelled "Hela". She's the ruler of the underworld and appears as a dark shadowy figure, either ghastly, half human, beautiful, demonic and corpselike. The daughter of the trickster god Loki, and Angrboda the giantess. Sister of Fenris wolf and the vast World Serpent. Her realm is the underworld, Helheim, Hel's domain, where souls of the dead reside who have not died in battle. Apart from warriors, She takes in anyone else who have passed away, from the elderly, to infants, mothers, those who've died of illnesses, in accidents, murder victims and executions. She sends the souls of the dead in different places of Her underworld, and souls of the wicked and nasty people end up in an icy cruel world. Although many people today view Hel as a monster, gruesome in appearance and in some popular culture, She's been regarded as evil, Hel was considered a benign goddess by ancient people. 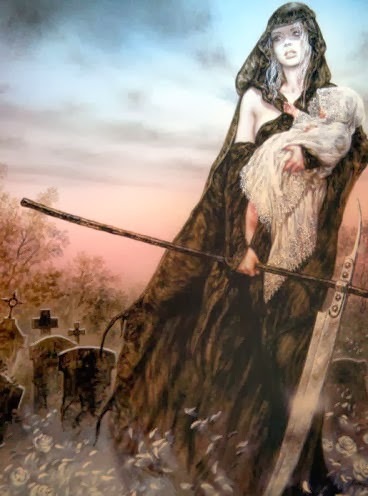 Hel was always a goddess of comfort to pregnant women and children. Women needed Hel during painful childbirth and if they died of labour, Hel would kindly watch over them and assist them to the underworld. When people, particularly women and children, were ill or in pain, they sought the spiritual blessing of Hel and turned to Her as She was a motherly goddess. Ancient people never saw death as evil. Death has been turned into an enemy of humans, and see death as something to avoid and fear. But death is part of nature and death, physical death of an individual doesn't mean the complete end. Over the centuries Hel was made grotesque and frightening so that people would avoid calling upon Her if/when they think they're going to die. Today some people are recognising Hel as not evil, wicked, scary and monstrous but mysterious and kind. Hel is one of the earliest Earth Nature goddesses that was understood by prehistoric tribes of people many thousands of years ago. Hel is possibly another aspect of the Earth Mother and this is due to the myths of Her residing in the underworld/underground, at the lower roots of the World Tree, and She is the gentle dark soil/earth that we'll all return to eventually after physical death. The ancient peoples who existed long before the Vikings, saw Hel as beautiful and fertile, but guarding of the world's sacred elements, the earth's passages, tunnels, caves, inner fires, animals, secrets of the spiritual realm and even ruler of gravity. However this mystical goddess of the realm of living, spirit, shadow, light, life, death is linked to the idea of the Dark Goddesses, who are all thought of as "evil" by people today. The divine mother figure of goddess Hel has been lost when it comes to Norse mythology. Yet the motherly Hel goddess figure has survived in fairy tales, as the loving Mother Holle (or Frau Holle/Holda) and other Germanic folklore. In Mother Holle the goddess Hel is also seen as the tender White Mother of winter. In one tale She helped a mortal girl sprinkle snow on the land by shaking feathers from pillows, and then gifted her with a shower of gold, turning the girl into an immortal. Hel is divine, a goddess of winter, spring, summer and autumn. She's nurtures, loves, heals from pain and comforts. Goddess Hel is from a time when people were Hunter Gatherers, but before Her people encountered the other people who followed the Vanir and Aersir gods. Hel is not the skeletal monster that modern twisted versions of the myth have us think.